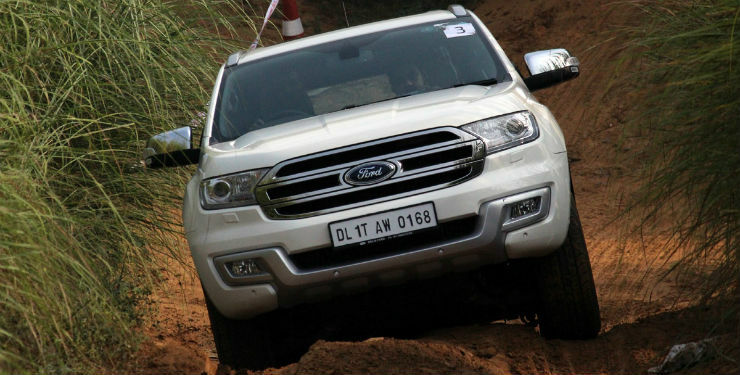 The arrival of the American off-roader in an all-new avatar did two things to the Indian market. First, it ended the long reign of the Japanese rival in the market. Second, it sent a clear message in the market that says a product needs to be rightly marketed to make it successful. The car massive SUV has become a common sight on roads nowadays and you do get a feeling of being overpowered by such enormous shells on wheels. We often notice people buying highly capable 4X4 vehicles and using them to subjugate other vehicles on the road. It is highly despairing that such highly equipped SUVs never taste a spec of dirt during their lifetime. 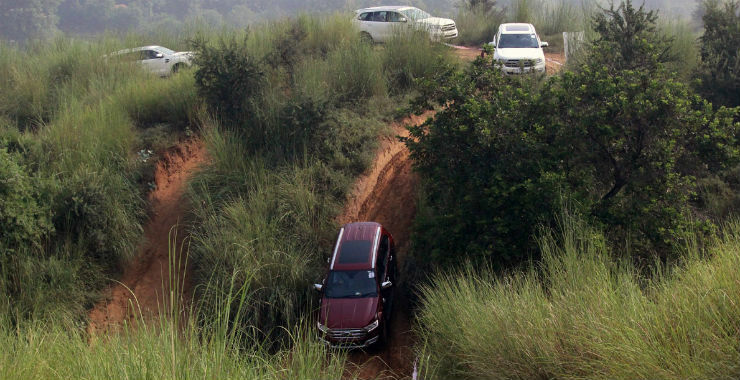 Maybe the sheer level of cosmetics on such SUVs make the owners feel that the cars have limited boundaries. 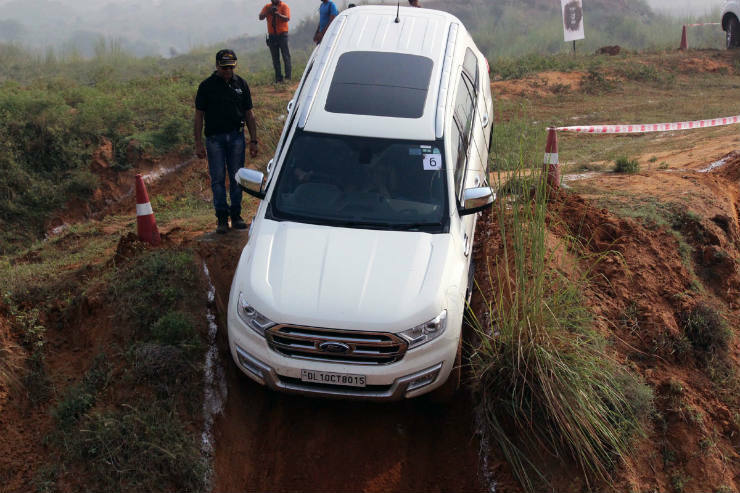 Ford India in a bid to let people know that just how far a good looking, luxury SUV can explore the wilderness gave us some time with the Endeavour at a specialised track showcasing that nothing can stop the juggernaut. The Endeavour carries a long list of equipment but to keep things uncomplicated, the car gets just a few buttons and a dial that can control the whole set-up and make the vehicle ready for any adventure with a touch. Only the top-end specification of the Endeavour was present for the job. The Endeavour is an extremely capable car and the top-spec model gets all armoury to conquer the terrain ahead. A 3.2-litre 5-cylinder engine that generates a maximum power of 197 BHP moves the vehicle. The mammoth of an SUV is moved by 470 Nm of maximum torque that starts to peak from just 1,750 rpm. The power goes through a 6-speed automatic transmission and a 4X4 transfer case to reach all the four wheels of the SUV. The best part about the set-up is the very easy to use but highly effective Terrain Management System. The modes can engaged by rotating a dial. There are times where you need to push few extra buttons (like 4X4 low) to engage on certain mode. The driver information display guides you through the process and overall, it is as easy as getting intimidated by the looks of Endeavour, and trust me, it is very easy, at least for a guy of my size. Auto Mode: The front and rear axle get a 40:60 distribution of power, where the front wheels get 40% of the torque generated and the rear wheels get 60% of the total torque produced. The wheels are constantly monitored by the traction control system and the the power ratio changes as required during any situation. This mode is good enough for you daily drive unless you have found a short cut to work that includes a river or two. Grass, Gravel, Snow Mode: This mode is perfect for slippery surfaces. It alters the accelerator to make it less sensitive and keeps the engine on lower rpm by upshifting quickly. The mode really helps when you decide to drive through a golf course on a winter morning. Sand Mode: The mode holds on the to gears and makes the engine rev to higher rpm. This mode also makes the throttle super sensitive. It should be very helpful to bring the car to the beach during family outings. Rock Mode: When all of the above fails to rescue you, rotate the dial to rock mode after putting the vehicle in low range by pressing few buttons here and there (the SUV guides you pretty well through the process). The rock mode can make the mighty Endeavour climb almost anywhere. The modes are just the front page of the book. The SUV gets a never ending list of equipment to help through any terrain. There is hill-decent control and electronically lockable rear differential. 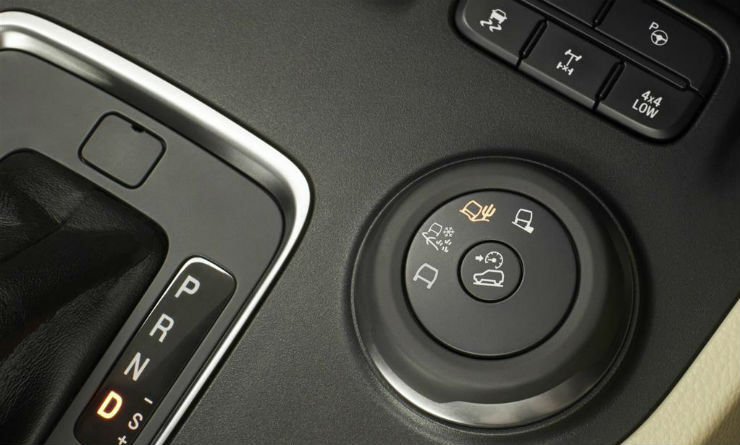 The low-ratio gearbox can be selected any time by pushing the right buttons on the dashboard. Endeavour has a collosal ground clearance of 205mm. The front and rear overhangs are quite short to help with the approach and departure angle of the vehicle. The muscular SUV gets huge 265/60 R18 rubbers on 18-inch alloy wheels. The Endeavour looks capable and sure is very capable too. Downhill and Uphill: The downhill looks scary and we engaged the hill decent mode. After few blinking lights become stable on the dashboard and after putting the vehicle in the rock mode, we let go of all the pedals. The electronics take over of the vehicle and we crawled down slowly to safety. The steep uphill section was done without the rock mode but kept the 4X4 low engaged with the differential lock engaged. The climb angle was pretty steep. Stepping on the acceleration locks the diff locks and climbed through the uphill without any sweat. The Raid: The obstacle had to be done in auto mode. The nice curvy dirt track had to be covered and it felt closer to real life conditions. The traction control kept things under control and induced much confidence even if you take a sudden turn during the course. We also went to the sand mode after this and it was really surprising to see the electronics at work. The car did not miss a chance to say that it is the best. Slush: We switched to the grass, gravel and snow mode. The slippery surface was take care by the huge tyres, which were not specialised for off-road use and the mode of the car. Even after being so heavy, the Endeavour did not slip much and covered by whole obstacle with a surprising grin on its face. Tilt: While following jungle trails, you do have to pass through twisted terrains and the tilt obstacle mimicked that. The SUV was tilted sideways at an angle of 40 degrees and yet it was in a great shape without any chassis turn or body bend. Water Wading: The Endeavour comes with a huge water wading capability. The SUV can take up to 800mm of water, which means it can go deep diving in the water. A few cars had already used the obstacle it was becoming little sticky so we decided to use the sand mode with 4X4 low ratio and differential lock. The sand mode gave sudden surge of power which you need midway to complete the obstacle. Entering the water slowly and giving power halfway to the vehicle can take you out of the situation pretty easily and quickly. Rumble Strip: The basic suspension test that is present on most Delhi-NCR roads. It was pretty easy for an SUV of this size. With ground clearance of 205mm, it was like doing cooling down exercises. Chicken Holes: The last of the obstacles, the chicken holes were alternative holes with depth of 1.5 feet. The holes test the articulation of the vehicle. I did the obstacle in 4X4 low ratio mode with the differential lock turned on. A lot of times, the wheels go up in the air, maintaining the diff lock and low ratio gives you the most of the power available in the car. The obstacle bought and end the course and the Endeavour stood tall and strong in front of us. The Endeavour is a pretty capable vehicle. Very few cosmetic SUVs come with such kind of features but the Endeavour did blow my mind. This vehicle can prove to be the perfect getaway vehicle for a family. Now that the new Endeavour is here, I am sure travelling to the dreaded places like Ladakh won’t bring a cringe on anyone’s face. Even with such capabilities, the Endeavour carries a lot of equipment to make the occupants comfortable and that take away a huge slice from the car’s abilities. 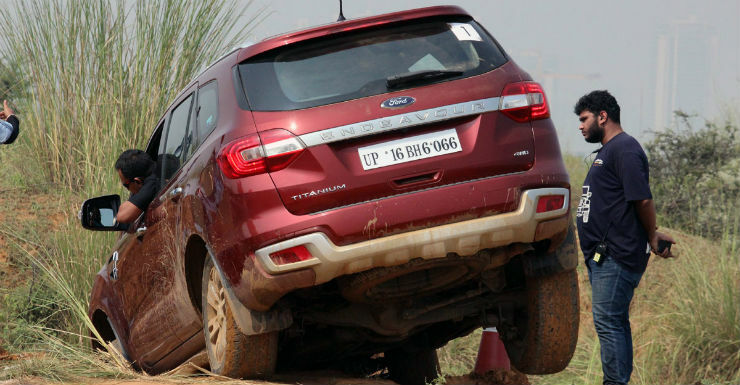 At any given day, the Endeavour would not be able to do extreme off-roading. The vehicle is excellent for a family with adventurous spirit.